Andres Torres has had a couple Feature Matches this weekend, and thus far each has showcased just how good he is with Performapal Pendulums. However, due to an unfortunate Deck List error he is without a Performapal Monkeyboard, a key combo piece to the Performapal engine. This hasn’t stopped Torres yet though, as he has managed to Duel through all of this and still make it to the finals. His opponent is Christopher Brown, another Performapal Pendulum pilot who has also shown quite a bit of mastery given that he has here. Only one can truly be the Master of Pendulum and take home all of the marbles, so who will it be? Torres won the roll and chose to go first. Torres opened a hand of Vector Pendulum, the Dracoverlord, Performapal Secondonkey, Treacherous Trap Hole, and two copies of Wavering Eyes. He Set all of his back row and activated Vector Pendulum, the Dracoverlord before he ended his turn. Brown drew and Normal Summoned Guiding Ariadne to make a direct attack. He Set three to his back row and ended his turn. Torres drew Performapal Pendulum Sorcerer. He Set the Performapal Secondonkey and passed it back. Brown Normal Summoned Performapal Skullcrobat Joker opting not to use its effect to try to play around Solemn Strike, but lost both of his Monsters to Treacherous Trap Hole. He pressed forward with Draco Face-Off for Vector Pendulum, the Dracoverlord and Master Pendulum, the Dracoslayer, Special Summoning the Vector Pendulum, the Dracoverlord ant putting Vector Pendulum, the Dracoverlord into his Extra Deck. He declared an attack with Vector Pendulum, the Dracoverlord but couldn’t beat over the DEF of Performapal Secondonkey. Torres drew Upstart Goblin and immediately played it drawing Performapal Silver Claw. He Normal Summoned it but lost out to Brown’s Chaos Trap Hole. Brown drew and made no actions. Torres drew Wavering Eyes. He placed Performapal Secondonkey in his Pendulum Zone and then played the Wavering Eyes he had just drawn to add Master Pendulum, the Dracoslayer, most likely because he did not have Performapal Monkeyboard. He Normal Summoned it but Brown responded with another Chaos Trap Hole to banish it. Without any other options, Torres ended. Brown Normal Summoned Performapal Secondonkey and overlayed it with Vector Pendulum, the Dracoverlord for Castel, the Skyblaster Musketeer. He used its effect to shuffle away the Performapal Secondonkey, then made a direct attack before ending. Torres drew Guiding Ariadne and placed it in his Pendulum Zone before ending his turn. Brown drew and made an attack with Castel, the Skyblaster Musketeer. He Set a back row and ended his turn. Torres drew Performapal Secondonkey and Set it. Brown drew and declared an attack, not being able to destroy Performapal Secondonkey. He Set a Monster and ended his turn. Torres drew Luster Pendulum, the Dracoslayer! He placed it on his Pendulum Zone and used it to destroy Guiding Ariadne, adding another copy and then triggering the fallen one. He revealed two copies of Solemn Strike and Solemn Warning, prompting Brown to give him Solemn Strike. He played the fresh copy of Guiding Ariadne on the other side of his Pendulum Scale, and then Pendulum Summoned Guiding Ariadne and Performapal Pendulum Sorcerer but lost out to Brown’s Solemn Strike. He triggered Guiding Ariadne and revealed two more copies of Solemn Strike along with Solemn Warning, prompting Brown to give him Solemn Strike once again. He Set both and ended his turn. Brown drew and placed Performapal Guitartle in his Pendulum Zone and then Performapal Lizardraw. When he tried to trigger Performapal Guitartle, Torres responded with Wavering Eyes. Brown had a Wavering Eyes of his own but Torres had a second copy! Torres banished Brown’s Set Upstart Goblin and added Performapal Skullcrobat Joker to his hand as well as dealt 500 damage. Completely blown out, Brown was forced to end. Torres drew Performapal Lizardraw and Normal Summoned Performapal Skullcrobat Joker to add Performapal Pendulum Sorcerer to his hand. He activated Performapal Pendulum Sorcerer and Performapal Lizardraw in his Pendulum Zones, then Pendulum Summoned Luster Pendulum, the Dracoslayer, Guiding Ariadne, and Vector Pendulum, the Dracoverlord. He Synchro Summoned Ignister Prominence, the Blasting Dracoslayer using Luster Pendulum, the Dracoslayer and Vector Pendulum, the Dracoverlord, then used its effect to Special Summon Master Pendulum, the Dracoslayer from his Deck. He activated the effect of Performapal Lizardraw to draw Archfiend Eccentrick, then overlayed Master Pendulum, the Dracoslayer and Guiding Ariadne for Majester Paladin, the Ascending Dracoslayer. He activated its effect to Special Summon Luster Pendulum, the Dracoslayer so he could Synchro Summon another copy of Ignister Prominence, the Blasting Dracoslayer to end the Duel! Poor hands on both side of the table ultimately tilt in Torres’s favor as Wavering Eyes seals the deal. However, there was a key instance where Torres not having access to Performapal Monkeyboard almost lost him the Duel. Can he manage to keep Dueling through this disadvantage? Torres had a hand of Performapal Silver Claw, Performapal Guitartle, Mystical Space Typhoon, and two copies of Performapal Pendulum Sorcerer. He placed Performapal Pendulum Sorcerer and Performapal Silver Claw as Pendulum Scales, then Pendulum Summoned his Performapal Pendulum Sorcerer from hand. He tried to activate its effect but lost it to Brown’s Effect Veiler. He Set Mystical Space Typhoon and ended his turn. 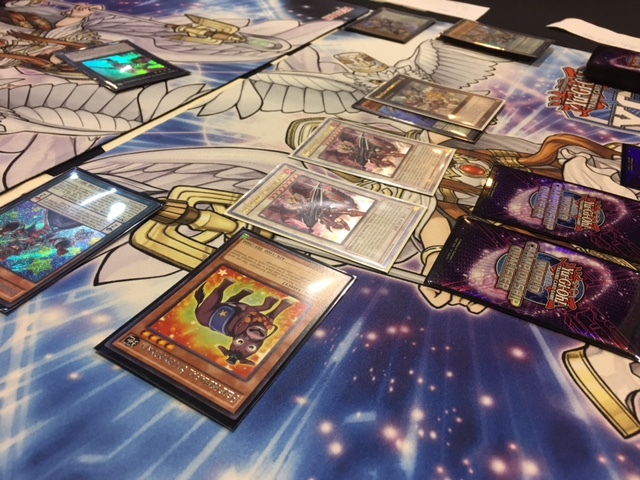 Brown drew and activated Mystical Space Typhoon, prompting Torres to Chain his Set copy onto his own Performapal Silver Claw in order to not get blown out by Wavering Eyes. Brown then activated Performapal Guitartle and Performapal Pendulum Sorcerer as Pendulum Scales, opting not to use the effect of Performapal Guitartle, and Normal Summoned Performapal Secondonkey to activate its effect. He added Performapal Silver Claw to his hand, then Pendulum Summoned it along with Vector Pendulum, the Dracoverlord. The Performapal Pendulum Sorcerer triggered to pump all of his Monsters, and after three attacks and Torres’s Performapal Pendulum Sorcerer being destroyed, only 2250 Life Points remained for Torres. He overlayed Vector Pendulum, the Dracoverlord and Performapal Secondonkey for Castel, the Skyblaster Musketeer, then used its effect to shuffle away Torres’s Performapal Pendulum Sorcerer. Torres drew Magical Abductor and placed it in his Pendulum Zone, then activated Performapal Guitartle and got a Spell Counter. He Pendulum Summoned for Performapal Pendulum Sorcerer and Performapal Silver Claw, activating the effect of Performapal Pendulum Sorcerer to destroy his Magical Abductor so he could add Performapal Skullcrobat Joker. He Normal Summoned the Performapal Skullcrobat Joker and used it to add Performapal Lizardraw to his hand, which he then played to trigger Performapal Guitartle and draw Master Pendulum, the Dracoslayer. Next, he destroyed his Performapal Lizardraw to draw Raigeki! He slammed it down and made direct atatacks with his own three Pendulums, leaving Brown with 2000 Life Points. In Main Phase 2, Torres overlayed Performapal Skullcrobat Joker and Performapal Pendulum Sorcerer for Castel, the Skyblaster Musketeer and used it to spin back Brown’s Performapal Pendulum Sorcerer. He then played Master Pendulum, the Dracoslayer and used it to destroy Brown’s Performapal Guitartle. Brown needed to draw Performapal Skullcrobat Joker, Performapal Monkeyboard, or Wavering Eyes to survive…and he didn’t! Brown extended the handshake! 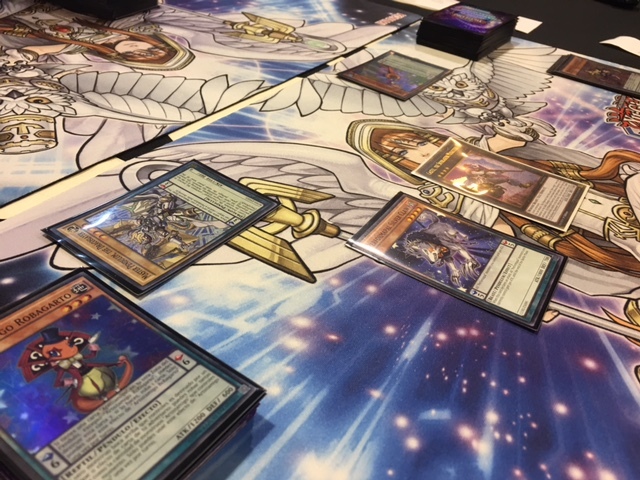 Even without Performapal Monkeyboard, Andres Torres gives an expert lesson on how powerful Performapal Pendulums is alongside a skilled pilot and takes down Yu-Gi-Oh! Championship Series Houston!